Prepare a disaster supplies kit for yourself and your home. You never know when a natural disaster or emergency situation will occur so it’s a good idea to prepare in advance. By gathering the emergency supplies you will need to survive the aftermath of disaster scenarios you give you and your family a much better chance of surviving. 1) First aid kit and essential medications. 2) Canned food and can opener. 3) At least three gallons of water per person. 4) Protective clothing, rainwear, and bedding or sleeping bags. 5) Battery-powered radio, flashlight, and extra batteries. 8) Keeping essentials, such as a flashlight and sturdy shoes, by your bedside. 9) A crowbar is also useful near your bed to exit in case doors jam. 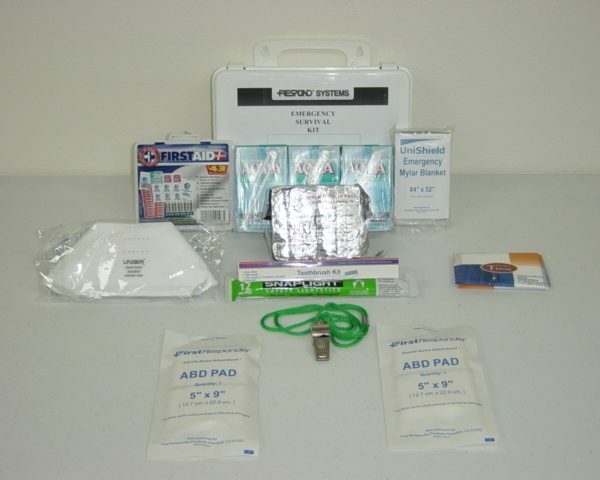 Individual Survival Kit for 3 days emergency preparedness including food, water, blanket and other safety supplies.